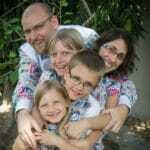 Missionaries Paul and Ali Federwitz serve with Lutheran Bible Translators in Ghana. They dedicate their lives to spreading the Word in native languages. Ali was born and raised in Akron, Ohio. At a young age she voiced her desire to become a teacher and never strayed from that goal. Paul was born in Liberia, West Africa, and lived there until he was 15 years old. As a son of missionaries, he knew that he would someday return to Africa as a missionary himself. Paul and Ali met while attending Concordia University, where Paul received a degree in Computer Science and Communications. Paul and Ali have been serving with LBT in Ghana since 2007. Paul is an information technology consultant and trainer. He helped the Ghana Institute of Linguistics (GILLBT), Literacy, and Bible Translation develop the people and infrastructure needed to provide computer services for their organization and the people who work with them. Now that the GILLBT IT team is functioning well on their own, Paul focuses his ministry effort on IT infrastructure and training over a wider geographic scope. Ali provides training, consultation, counseling, crisis response, and referral for cross-cultural workers. She helps missionaries to not just survive the stresses of cross-cultural ministry, but to thrive. LBT is seeking Lutherans to serve overseas through the ministry of Bible translation and Scripture Engagement. If you feel that God may be leading you towards missions, LBT may have a place for you.